A higher number of employees are quitting their jobs, and the number of employees let go or laid off has declined steadily, according to the latest data from the Bureau of Labor Statistics’ Job Openings and Labor Turnover Survey. 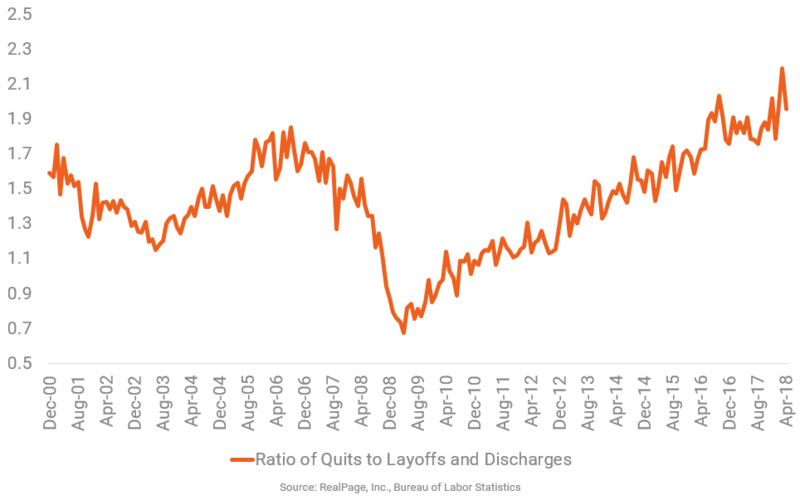 Signaling continued improvement in the economy, the ratio of quits to layoffs and discharges has matched or exceeded 2.0 for four of the past five months and was at its highest level in April 2018 since the survey began in 2000. Chuck Ehmann is a Real Estate Economist for Axiometrics, a RealPage company. He provides research, analysis and insight into the economic, demographic and financial trends affecting the multifamily industry. With more than 30 years of experience in real estate market and economic research, he has extensive experience in all phases of real estate research, analysis and reporting. Prior to joining Axiometrics, Chuck Ehmann spent 11 years with MPF Research as Data Resources Senior Consultant and 12 years with Guaranty Bank as Director of Economic and Real Estate Research. He remains active in the real estate research and economics community, serving as the president of The Dallas/Fort Worth Association for Business Economics and as a member of the D/FW Real Estate Research Forum’s Advisory Council. Chuck holds an MBA in Real Estate from The University of Texas at Arlington.